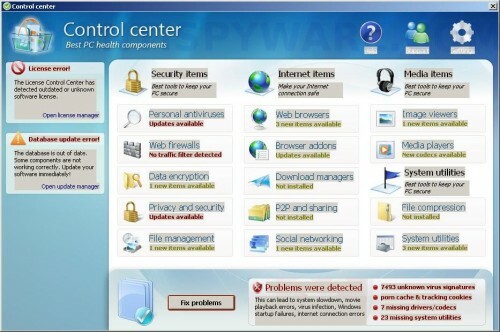 Control Center is a fake Windows optimization program that distributed through the use of malware. When installed, Control Center configures itself to run automatically every time, when you start your computer. Once running, Privacy Center starts scanning the computer and list a variety of problems on your computer. All of these problems are fake, so you can safely ignore all that the programs gives you. While Control Center is running your computer will display a fake warning from your windows taskbar. One or several components reported some problems! this notification to eliminate vulnerability immediately! The warning is a fake and should be ignored! 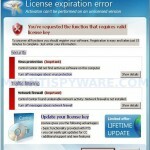 As you can see, the program is designed only for one to trick you into buying the software. Instead of doing so, use these removal instructions below in order to remove Control Center and any associated malware from your computer for free. 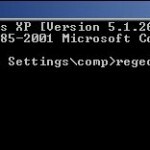 Please read the article: How to reboot computer in Safe mode and reboot your computer in the Safe mode with command prompt. Once Windows loaded, command prompt (black window) opens. Type regedit as shown below. In right part of window, double click to Shell. Press OK. Close Registry editor and reboot computer. Select Perform Quick Scan, then click Scan, it will start scanning your computer for Control Center infection. This procedure can take some time, so please be patient. Make sure that everything is checked, and click Remove Selected for start Control Center removal process. When disinfection is completed, a log will open in Notepad and you may be prompted to Restart. 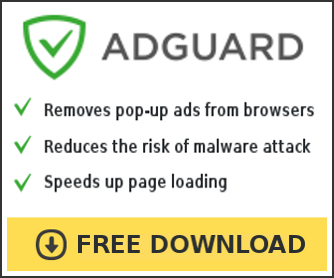 How do I download the malware thing initially? I can’t bypass the message to get online to get to that link or anything. (I am typing this from my laptop). Try boot your computer in the Last good configuration. Go to “settings” (top right). Change the settings to allow computer to run in an “unprotected” state. It’ll warn you that this is an absolutely horrible idea, of course, but your computer will run normally enough to get rid of the problem! close out the control center program.. then you can click on the file tab in the tastkbar top left.. i still cant get it off my computer,but this will help you get started..
I’ve discovered all the tricks to get around it to complete my projects. But when Internet Explorer is open, The pop-ups are such a nuisance the I rarely bother to go online. @porkchop- It wouldn’t even let me Contol/alt/delete… I would have to do a hard boot. Also I removed it from Control Panel, Add/Remove programs, numerous times the I see it start up again. Thank you and I hope this works. 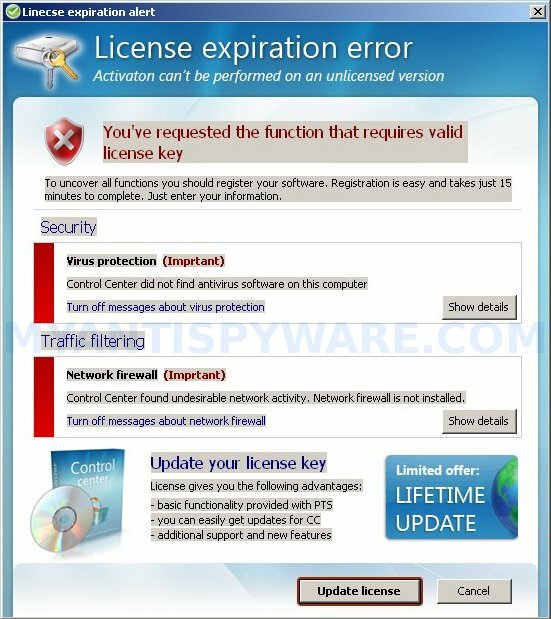 Virginia, if above guide does not help you, then ask for help in our Spyware removal forum. 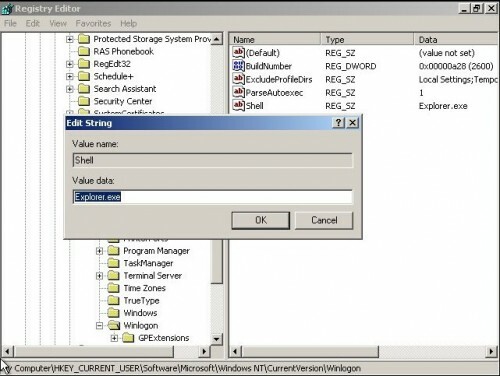 The part about removing the “explorer.exe” from shell does not work. When you reboot the problem is still there. When you reboot to safe mode, you dont even get your safe mode win xp interface, just a black screen with “safe mode” in the corners. To go back to square one, boot in safe mode with command prompt, type in regedit, then retype “explorer.exe” back into shell. Not a question about instructions, tho’ I may have one later, but since so much is known about this ‘malware’ why are they allowed to do it? This company has stolen – converted if you will – my property. I cannot consent to something unknowingly, that is not legal consent. Why aren’t the owners in jail or something? The location for the explorer.exe to enter in was in the HKCU location for me not the HKLM as stated above.